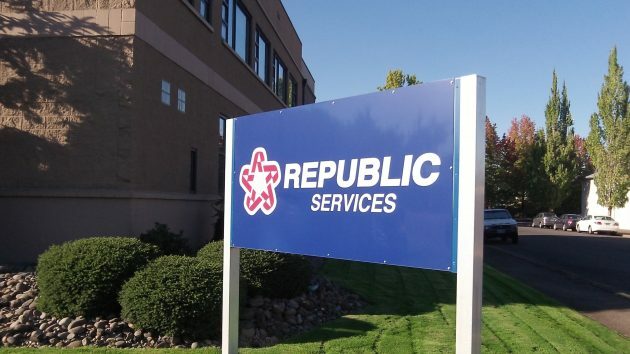 The local headquarters of Republic Services in Albany. Republic Services has a deal for the disposal company’s Albany customers: We’ll raise your rates $3 a month, and in return we’ll pick up your yard debris every week, instead of biweekly as now, and you can put food waste in with the yard clippings if you want. At a work session Monday, most of the city council seemed ready to sign off on the change when it comes up for action later on. Twice before, the council said no to weekly yard-debris-plus-food-waste pickup. Republic representatives Julie Jackson and Kevin Hines brought it up again Monday. They said that in an online survey, nearly 54 percent of 1,030 respondents wanted to pay more for weekly yard debris pickup. The company says it has 14,675 residential customers in Albany. Only Councilman Rich Kellum sounded skeptical. The survey respondents favoring it, he noted, are only a small minority of customers, but all customers will have to pay the $3 monthly price jump if the council authorizes it. Residential trash collection service now costs $18.31 a month for a 32-gallon cart. It includes weekly collection of commingled recycling plus the yard debris pickup every other week. That class of service will go up a nickel per month on Jan. 1, 2017, under an agreed-upon schedule based on inflation, the price of diesel fuel and the dumping fees levied by the Coffin Butte landfill, also a branch of Republic Services. Other residential services will see similar increases averaging six cents a month.. The company reps said food waste accounts for up to 40 percent of trash in Oregon, and customers may be able to save money by downsizing their trash carts when food scraps are recycled. The disposal service charges less for smaller carts or less frequent service, which also is available. If the council agrees, the weekly yard debris and food waste service for Albany customers would begin in March 2017. Republic customers in Lebanon and Corvallis already pay for weekly yard debris and food waste pickup. Republic says they are proposing the same service boost for Albany customers outside the city limits in Benton County. Yard debris weekly? Who needs it in Winter? I pay a landscaper and never have yard debris. Food is 40% of residential? I call BS on that. Polls are biased as only the people who would want the extra service are motivated to vote “yes”. This price increase garbage smells fishy to me. Do you pay your landscaper $3 to haul off your yard debris? It might be a lot more. Your comment on pools is pretty lame. It seem to me more likely that people who are opposed to a fee increase might be more motivated since they have something to lose. Polls aren’t biased. They report what people say. It doesn’t mean things are exactly representative since it’s a combination of the confidence level assigned to the statistical analysis and the margin of error. The standard confidence level is 95%, the margin of error on roughly 400 response is +/- 4% or so. The larger the sample size, the smaller the margin of error. Mr Woods, maybe in North Korea the polls aren’t biased!!! It seems high, but may be correct because it’s probably figured by weight, not volume. Typical packaging and other non-food junk is lower density, therefore it _looks_ like it should be more than 60%, but might not be. More important question: Are things separated as well as they should be? Going weekly on the “yard” cart will allow me to easily go down to a 32 gal. container vs. the current 90 gal. one. That alone saves $10/mo. plus I get the advantage of being able to add 100% of our food waste to the mix. It is good & will get my vote at the proper time. As a representative, one must consider how fees impact all residents, not just your particular use case. I doubt that the majority of households which are currently using the larger trash can will be able to get by with the smaller one due by moving their food waste to the yard cart. Justifying a change because it decreases your cost, and disregarding the fact that it will increase cost for others is not good representation. EVERY decision (vote) I have ever made has been and (will be) predicated on what I feel is in the best interests of the entire community. Period. So how much food waste do you have per week? It must be astounding and would indicate a very wasteful person. That kind of person should not be in a position of power. The city council shouldn’t even allow Republic to do business in this city until Republic accepts cash for payment. You know, that paper stuff in your wallet that says “This notr is legal tender for ALL debts, PUBLIC AND PRIVATE”. Republic conducting their own poll is akin to the fox guarding the hen house. Would you expect any other “results” when they are trying so hard to extract additional money from the consumers. Is anybody auditing “THEIR RESULTS”? I haven’t used my yard cart for 6 weeks. Why should I have to pay twice as much for nothing? Well Republic, if you get what you want, my yard waste goes into the garbage cart first until it’s full. I hope others join the protest. I already pay to have only the smaller trash can, a privilege that makes me proud to be an American. So, it would appear I am already not tossing 40% of food waste into the Republic Services maw. Why then would I wish to see my rates increase by this amount just so Republic can ding large trash can customers. While I never agree with Kellum n anything, in this instance he seems correct. Perhaps Republic Services could enter the 21st Century and put indelible bar codes on each type of trash container. Then, when they pick,it up, a truck scanner could monitor the types of trash and send out a bill that only charges the customer for their actual use, not some fantasy statistics they feed the Albany City Council. I am very against this, and wonder why the council made such an abrupt turnabout from earlier this year. This is just a money grab, a way to increase revenue. Weekly yard cart service will not be used most of the year, so this is money for nothing for out-of-state owned Republic services. There is no way that 40% of our weekly trash is food waste. That is a misleading data point made to justify the money grab. I do not need weekly yard debris pickup and don’t want any extra charges imposed. I can understand what motivates Republic’s desire to increase gross receipts and their bottom line. But let’s not ignore what motivates the City of Albany – greed. This increase is in effect a tax increase. Republic operates a monopoly granted by the City of Albany. Customers are captive. The increase to Republic’s gross receipts means the City will increase its haul through the franchise fee which trickles down to every captive customer. This is simply another way for the City to reach further into your wallet without asking for permission first. Perhaps the code should be changed to require voter approval before the City is allowed to take more money from its resident. In consideration of the franchise granted by this chapter, the franchisee shall pay to the City six percent of gross receipts for this right, privilege and license, to be paid monthly. (Ord. 4707 § 1, 1986; Ord. 4083 § 6, 1977). Interesting point! Unlike other monopoly or duopoly providers for our area, Republic doesn’t break out or show a franchise fee on the bill. Wonder why that is? For the additional $3, please make glass recycling every week too. This would simplify things for the folk. Never surprised to see glass bins curbside when it is not their week. I too must reference the supplied shaded calendar card from time to time. Before examining the results and applying your “statistical analysis,” look at the way the sample is formed. It’s biased on its face. When all that can be said about the sample is based on “it seems to me,” it’s probably not a good sample. Who even reads the circulars that come with a bill? Better evidence is required. 54% is hardly overwhelming even at that. All other things being good, a 54% majority with a margin of error of 4% is hardly compelling. If I find that my representative councilors vote for this, they will not have my vote again, period. I never saw a poll to participate in. Ray provides “statistics” that are not valid. A valid poll needs to be independent and based on a random sample. This type of poll does not qualify. My trash is already as minimal as it can be. I compost all vegetative material that does not go into the yard bin. I have so little food waste that a year’s worth could fit in a shoe box. My bigger question is: why in the world are you all wasting so much food? Wasting food is the same as wasting money. And now you will be wasting more money on your wasted money if council has its way! Mr hj, Republic doesn’t recycle the bottles. They crush’em in with the garbage. Got that bit of info from a driver. Those blue bins just make more effort for the driver. But Republic doesn’t want to rain on anyone’s recycling day so they keep collecting them. JE, unfortunately your statement is in direct conflict with the talking point from their customer service as they do recycle the glass. Sure, it is crushed/smashed/broken but not tossed in all the other rubbish. People do toss a lot of bottles with deposits in those blue bins. This circles back to a previous HH posting. Those nickels do add up and could really help student fundraising events. Thank you Rich, that is exactly what I want to hear. I have not been able to contact my council reps through the city website email system. Please let my other councilor know that there is at least one sane constituent in SE Albany who is against this plan! I’m sure I am not the only one.